Starring: James Franco (Spider-Man), Michelle Williams (Shutter Island), Mila Kunis (Black Swan) and more. Rated: Rated PG for slightly scary sequences and mild language. When news first broke out about this project, many misunderstood the film’s intent and first thought that the classic Wizard of Oz was about to be remade. Soon after it became clear that it was not a “remake” but was, in fact, set to be a prequel and sighs of relief came from many…until, perhaps, people learned the director of the disappointing Spider-Man 3 (Sam Raimi) would be at the helm with “Mr. Smug” (James Franco) himself in the title role. I actually didn’t mind any of these factors and with anticipation looked forward to what I hoped would be the first great movie of 2013. 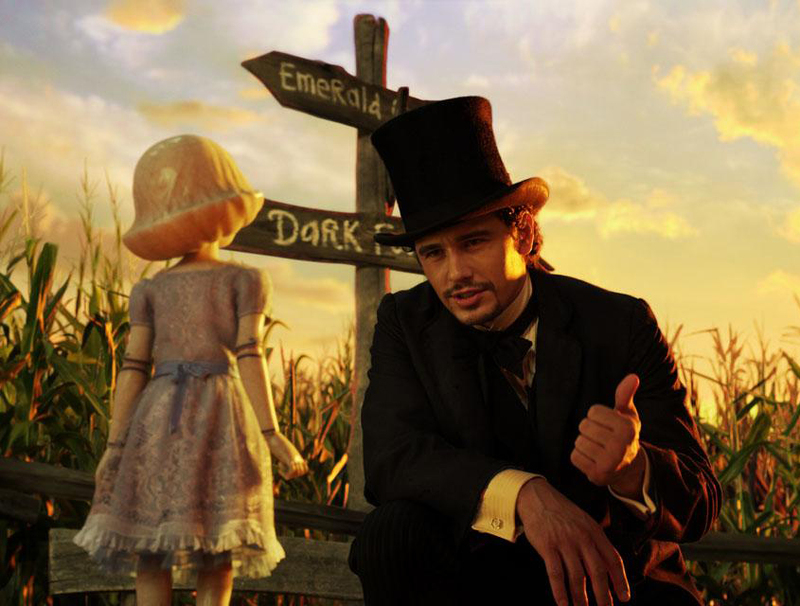 Is Oz the Great and Powerful truly great? Hit the jump to follow the yellow brick road of my thoughts. Sam Raimi quite skillfully and pleasantly takes us back to the land of Oz for the “first” time and it never looked prettier! 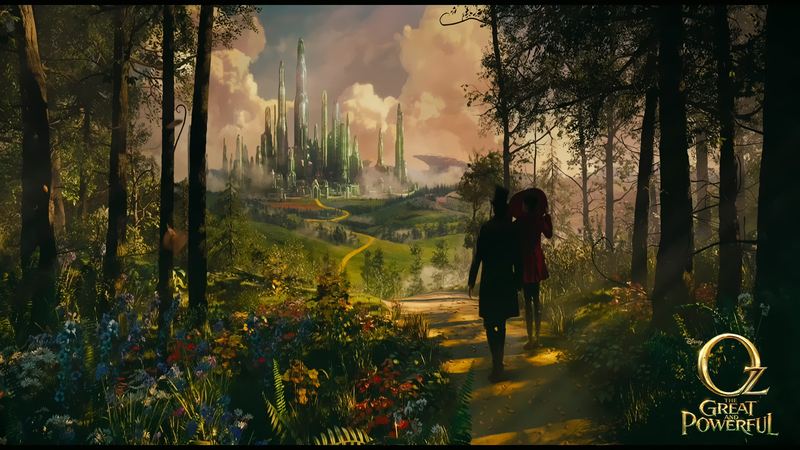 The vibrant colors, the odd creatures…Oz looks exactly how I wanted it to and the Emerald City…wow. Impressively, Raimi brings us into the land of Oz but first takes after the pattern of Dorothy’s famous travels by landing us smackdab in the middle of a black and white Kansas to see the beginning of the soon-to-be wizard’s journey to greatness. Let’s get the comparisons over and done with, shall we? Suffice it to say, Oz:TGAP is an underwhelming, yet fun film to watch (and even more so in 3D), but nothing still beats the original. I think we all expected that. Aside from a few things like poor pacing and the underdevelopment of characters, there are some things that I’d like to point out. 1. Casting. 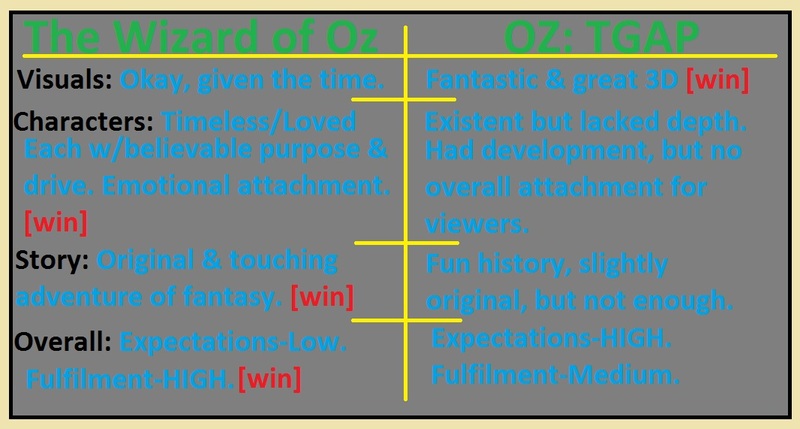 Something MUST be said for the rather impressive casting of Oz:TGAP. Major props to Casting director John Papsidera who also directed the casting for a few other little films like The Dark Knight, The Prestige, Zombieland, Inception, the upcoming film Ender’s Game and more (although, we must forgive his casting for the dreadful Dragonball Z: Evolution). James Franco, Mila Kunis, Rachel Weisz, Michelle Williams, Zach Braff and, yes, even Bruce Campbell all grace the screen as characters in this beautiful prequel…and they do it pretty well. 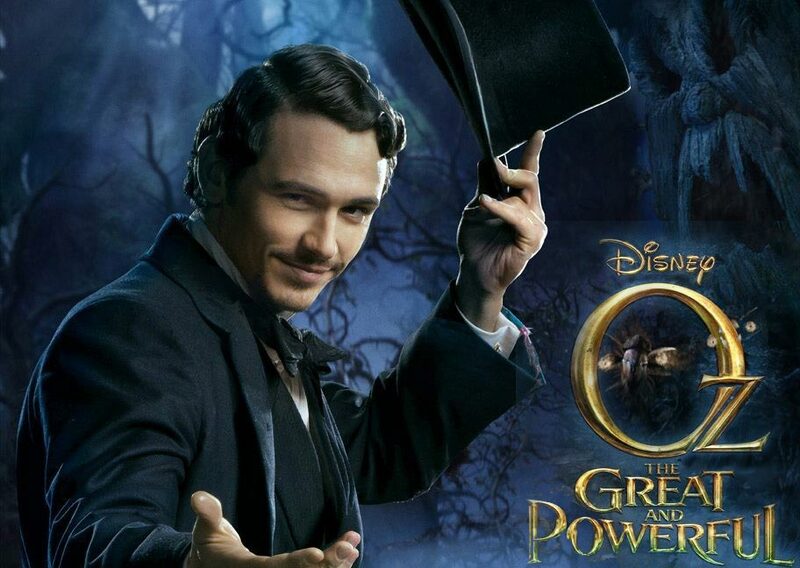 James Franco, not surprisingly, really pulls off being a self-indulgent, over-confident, pompous wizard. Though, I will say that something felt a little “off” about Mila Kunis in her role as the movie progressed. 2. Background. This film has the benefit of The Wizard of Oz‘s success. Good thing they do not ignore most of it as it serves to really flush out some of the things that would otherwise require even further longer explanation amid the semi-dragging story. The nostalgia from the classic keeps parts of this otherwise mediocre, yet beautiful, movie alive. 3. Visuals. So glad that Raimi did this in the fashion he did as opposed to the scary look and feel of Return to Oz (anyone remember that horrible sequel?). The visuals make this movie pop and help keep the attention as the story’s excitement fades in and out. Although, it was a bit too much “Alice in Wonderland“-ish for my liking. Although, I’m not sure that whatever tricks the wizard may have in his hat will be enough to keep it going for the already planned sequel. But keep the hope alive, because, “if ever a wonderful wiz there was, the Wizard of Oz is one because….because, because, because, because, because”…aww, you know how it goes. 1) I LOVE Oz – I was obsessed with the books as a child. 2) I LOVE Return to Oz!!! I watched it religiously when I was 7 and still own it and watch at least once a year. 3) I’m going to see this tomorrow (or rather today, I suppose…) – yay!! 4) Great review! Love how you broke everything down. 2. I watched Return to Oz a few times, but man those langoliers and the headless queen and all scarred me for life as a little kid. haha. 1) Awesome – always happy making to meet another Oz fan! Yeah, so many little things that they had to dance around because of the legalities and picky contracts. “Suffice it to say, Oz:TGAP is an underwhelming, yet fun film to watch (and even more so in 3D), but nothing still beats the original.” ~ Definitely agree. My friends and I ended up watching in 3D (which I HATE) but the 3D part wasn’t too terrible. It was very underwhelming though – I expected so much more but visually it was fun and overall it was fun. “Though, I will say that something felt a little “off” about Mila Kunis in her role as the movie progressed.” ~ Also agreed here. I’m not sure what exactly it was but she was less believable to me as the wicked witch. My summary would be – lots of substance, small on plot (the actual plot was way too little); I kept getting knocked out of the story by how often and repeatedly they picked up and put down China Girl, often within a matter of seconds (what was that about?? ), visually appealing, some nice homages to the original. Also where was Bruce??? I didn’t see him at all! Sorry, lots of style not substance. Mixed that one up. 1. Somewhere over the Rainbow is super special because when I was born I had a teddybear given to me by my uncle. It had a windup dial on its back that would play an instrumental version of the song. My mom said it put me to sleep a lot and she loved the bear (placing it in my crib often). As I grew up, it was a song I learned to play on the cello for my mother and still love it. My uncle, unfortunately, passed away as a result of drunk-driving the wknd before Princess Diana did. When I hear the song, I think, not only of him, but my mom (who I play it for via webcam on my cello from time to time on Mother’s Day. She still cries like she did many years ago at my 6th grade recital). It’s a very special song. 3. Yep, i agree. lots of style, little substance. I wish I could say Mila was great. Glad we really see eye to eye on that. Good Review but I can’t agree with the visuals match up and I haven’t even seen the movie. The special effects and just use of color were mind blowing for the audience in 1939. I don’t believe that the 3D can compare to that. Still, awesome review. You bring up a good point in that, for the time, it was amazing colors. 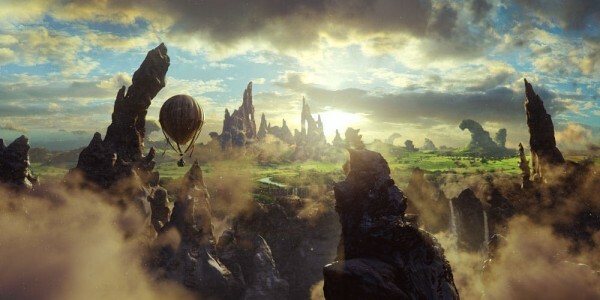 But the visuals in Oz:TGAP were pretty legit. I liked them, but, might imagine more people said “wow” back in 1939. I’m gonna have to agree with this comment. 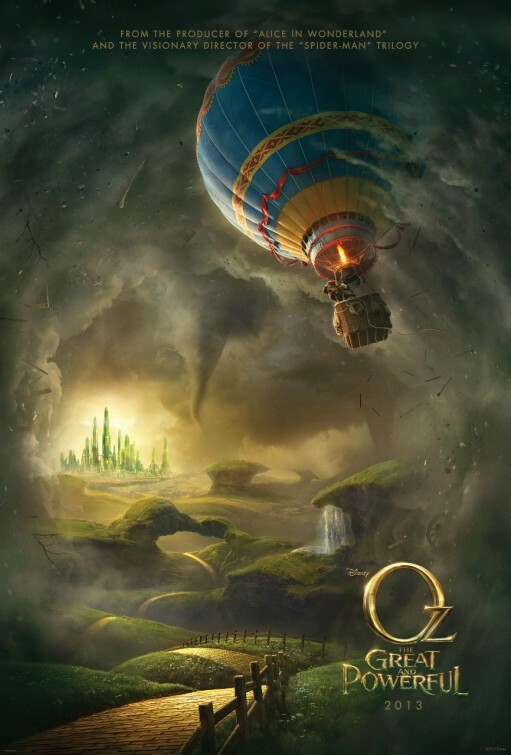 The visuals for Oz (not that I’ve seen it, so I’m not exactly the most informed opinion) look pretty good, but the foundation of the visuals and that sense of wonder will always be rooted in the original. If anything, this movie reminded me that it was good to be back in Oz and it’s a place that I would have no problems still showing up to every now and again. Good review T.
it was nice to see Oz once again. no doubt. Thanks for the comment Dan the Man! Nice review, Terrence. Sorry to hear this came across as a middling effort to you. About the music… do you mean there aren’t any songs, or just that they aren’t as catchy as the ones in Wizard of Oz? Thanks my friend. I wanted to like it more. In regards to the music, there are perhaps a couple songs but so forgettable…I don’t even remember. Just…lower your expectations. OK. That’s not so bad, then. The only song from WoZ I really remember liking was “If I Only Had a Brain”. “Yellow Brick Road”, “Ding Dong” and “We Welcome You to Munchkinland” all get really old really fast. Nice review, Terrence!! I admit I wasn’t looking forward to this film, especially with Franco in the lead (given his track record with coming off as utterly laid back in roles) but I’m pleased to hear they haven’t managed to completely trash the Oz legacy. I note you’re “Alice-in Wonderland-ish” comment too – this is something I felt from all the trailers, was that they’d simply rehashed the AIW style of an overdose of CGi and green-screen work, allowing precious little for character. Glad to see they learned from Wonderland in time to balance it better with Oz. I’ll check this out on Blu, I think it’ll look fantastic! Rodney! Thanks for reading and for the kind comment. Yes, if one isn’t careful there are some scenes that could be mistaken as Alice in Wonderland. It will def look fantastic though on Blu-ray! I thought the music was great… blended in well with the picture, and amped up the action. You are right about Mila Kunis, they could have gotten a better actress. Hey Ipodman. Thanks for adding to the convo here. I like Mila in the 1st half. Interesting though, perhaps all the CGI made her not so believable to me in the 2nd half. you’re not wrong. a solid “March” win and an impressive debut weekend. families did and are responding well to it. But it left me wanting. Still good, just not great. But is it kid friendly? You did a good review, but is it a kid movie, or intended to appeal to the kid in us? My four year-old watched it without difficulty. There were a few scares but nothing that bad, I saw a lot of children in the theater. Appreciate this comment as I did see kids in the movies, but didn’t have any accompanying me to gauge their reaction. Saw this one yesterday with the whole family. My boy loved it, I felt if was pretty average and my brother and wife both hated it. haha. brother and wife hated it?! LOL. I think my reaction mirrored yours as it was “pretty average” for me too. 🙂 Thanks for sharing. Great review T. I’m most curious to see how Franco fares in this role, as he’s not the first choice. I wish I had been able to make it to the press screening, but I still might pay for the matinee for this one. Hi Ruth! Thank you for reading and for the compliment. I will say that Franco was pretty believable and did well. I wish you could’ve seen it early as well as, undoubtedly, several viewings now will be packed. Look forward to your thoughts on it. Great review. You and I are on the same page. I thought Mila was miscast until she turned green, then I loved her. Hey Victor! Thank you for reading and for the kind comment. I liked Mila more before she was green, myself, but it was just okay still.